The DRA-ACT-SI AND DRA- ACT-SV Series are self-powered ac current and ac voltage input DIN rail mount signal conditioners that use the measured input to produce an accurate and linear output current. These signal conditioners have excellent accuracy, linearity and stability which make them unique. 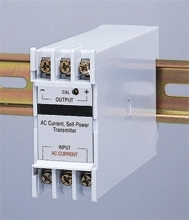 The DRA-ACT-SI Series of ac current input models includes models for 0-1 Aac and 0-5 Aac inputs with a choice of either 0-1 mA or 0-20 mA output. The DRA-ACT-SV Series of ac voltage input models includes models for 0-150 Vac and 0-300 Vac inputs again with a choice of either 0-1 mA or 0-20 mA output. The output current from all of these self-powered models always starts at 0 mA since these units are powered from the measured signal. Therefore, when the ac current or voltage input is zero, the output is zero. For complete safety, an internal transformer isolates the signal conditioner input from the output thus enabling these units to withstand large momentary inputs. The input to output isolation provides high output signal-to-noise ratio which makes these signal conditioners highly immune to ground loop signals and RFI.